Question: I live in Newcastle. Our water is awful. I have bladder cancer and I also react to many things, including chlorine. This is preventing me from enjoying a bath. I am interested in whole home filtration but would like to exclude garden and toilet. Is that possible? I am also confused with what would be best. At the moment I am looking at CQE-WH 02102. Any clarification would be appreciated. WBH Answer: How home water filter systems work depends a lot on how the water source is hooked up to your home. So it is best to talk to the water filter company about whether it will exclude garden and toilet. I think most do exclude garden, but not toilet. 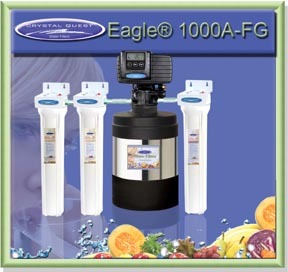 The CQE-WH 02102 is an excellent choice for a whole house water filter system. However, in your situation (with bladder cancer), I would recommend that you get either a countertop or under sink filter for your drinking water AND a bath filter and shower filter -- rather than a whole house water filter system. The reason I say this is because I don’t think that whole house water filters adequately filter water for drinking, especially if your house is more than 5 to 10 years old, and especially if you are dealing with a serious illness. With a whole house filter, the water is filtered at the “point of entry” into the house. But then it has to pass through the pipes inside your house from the point of entry to all your faucets. It is not uncommon to have heavy metals (such as lead from corroded pipes) or other microbial contaminants in the house pipes. Thus, when the water comes out your sink faucet, it may not be as clean as you think. It is certainly much cleaner than tap water, which is why I do recommend whole house filters in general. But to ensure you are getting the absolute best filtered water (which of course is critical when you have cancer), I recommend a “point of use” filter, such as a countertop or under sink filter. (Faucet-mounted filters are also point of use filters, but their filtration is much less effective than countertop or under sink systems. Since you are already sensitive to chlorine and other chemical contaminants, I think you are going to get better filtration with a bath/shower filter rather than the whole house filter. The bath ball filters and shower filters work really well to get rid of most chemical contaminants, such as chlorine. Thus, I would recommend you get both so that you can take either a bath or a shower. (They are relatively inexpensive, about $35 each). As you will see, purchasing a “point of use” countertop or under skink filter for your drinking & cooking water, along with a bath and shower filter will be less expensive than a whole house filter, and in your situation I think it will be a more effective choice for ensuring you get the cleanest drinking and bathing water. Crystal Quest bath ball filter or you can choose one at Amazon.com. I hope this doesn’t confuse you more, but I do believe this is a better option for you than a whole house filter. Each of the 2 to 4 choices listed on my recommendation pages are high quality filters, so I hope this will make the decision easier for you. The home water filtration I recommend to anyone with cancer is this: (1) a countertop or under sink water ionizer, (2) a shower filter and (3) a bath ball filter.